Katie Pratt’s winning drawing, on display in the Village Bakery window. 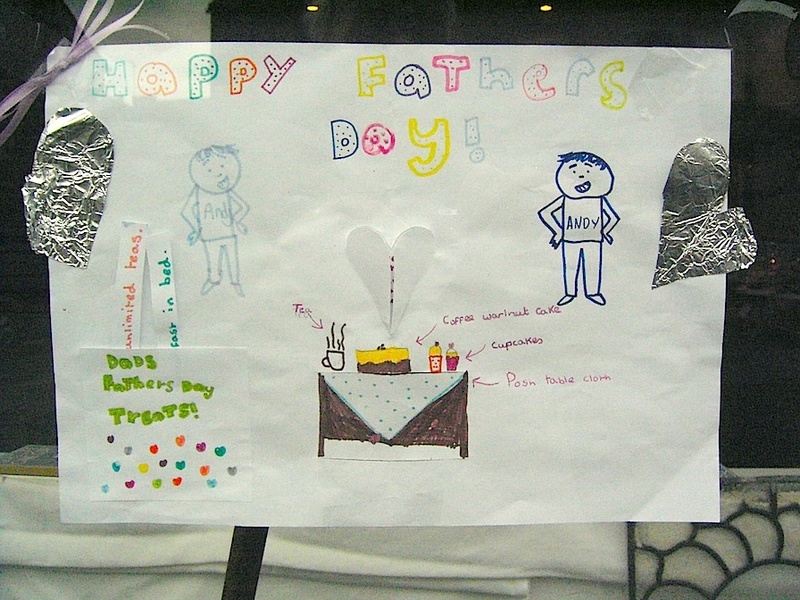 Congratulations to Katie Pratt on being chosen as the winner of the Village Bakery’s Fathers’ Day drawing competition. A lot of thought and work obviously went into her drawing. Lucky Dad! All entrants were able to collect a free cupcake yesterday. A late reminder that there’s a musical performance this evening at Prince Henry’s Grammar School, supporting Menston charity Angels for Children. At 7.00pm, the event features Prince Henry’s senior performance students. Tickets are £5 (£3 concessions), on the door or from http://www.jumblebee.co.uk/phgstickets. The MG TD shown in the middle in the picture at the Yorkshire Post Classic Car and Vehicle Rally at Harewood House got a ‘runner up’ in the sports car category. Menston owner Steve Ellams says he got a ‘third’ when he attended the show with this MG 21 years ago so is hoping for a win at the show in 2036 though he’s worried about being able to get into and out of the car at 84! The picture also shows a “stunning” Daimler Dart and MG A. Very windy but nevertheless much better weather than last year for Menston in Bloom‘s annual strawberry tea and plant sale, this year at the Mackenzies’ in Park Road. 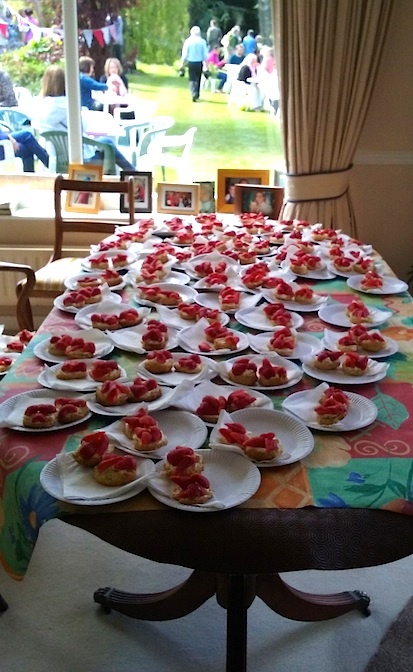 The picture shows strawberry teas waiting to go out – delicious! The Yorkshire in Bloom judges will be in Menston on 10 July so it’s not too early to be tidying wherever you can. There are sure to be more formal ‘work sessions’ before judging day and any help will be very welcome. Email Gemma Kelmanson (gemmaspace@tiscali.co.uk ) for details. This entry was posted in Events, Menston, Menston charities, Menston groups, Uncategorized and tagged Angels for Children, community, Harewood Classic Car & Vehicle Rally, Menston, Menston events, Menston in Bloom, Menston Village Bakery, Menston website, MG TD, Prince Henry's Grammar School, village shops, Yorkshire in Bloom. Bookmark the permalink.